Symptoms produced by brain tumors are largely related to their site, size, and rate of growth. Symptoms may be due to elevation of intracranial pressure related to tumor growth, associated cerebral edema, obstruction of cerebrospinal fluid pathways with development of hydrocephalus, obstruction of cerebrospinal fluid absorption mechanisms, or intratumoral hemorrhage. Personality change, easy fatigability, listlessness, mental slowing, and problems with attention and concentration are commonly noted by patients when there is a rapidly growing tumor. Without intervention or diagnosis, continued elevation of intracranial pressure leads to deterioration to unconsciousness and ultimately to coma. Signs of increased intracranial pressure may be subtle or marked. In its most obvious form, disturbed level of attentiveness, alertness, or frank coma may be observed. Seizures are a nonspecific presenting symptom in adults with brain tumors. Tumors within the occipital lobe may present with irritative phenomena such as nonformed visual hallucinations or a visual field defect. Intra-axial tumors involving the cerebral hemispheres, brain stem, basal ganglia, or cerebellum may present with specific clinical constellations of symptoms. Extra-axial non-glial neoplasm may also present with focal neurologic symptoms. Focal symptoms and signs are usually due to interference with function of a specific local area of brain. Clinical localization may be assisted by knowledge of the function localized to any of these areas. Some general comments can be made. Tumors of the frontal lobe commonly present with alterations in personality, behavior, motivation, mood, and memory. Within the dominant hemisphere, laterally located (usually left) frontal tumors may produce expressive language difficulties. Posterior frontal tumors bordering the primary motor cortex may produce irritative phenomena such as focal simple seizures with motor phenomena or secondary generalization. Direct invasion by glial neoplasms or compression by extra-axial tumors may produce frank loss of function. Initially this will begin in the contralateral extremity and progress in both severity and degree. Face, hand, and arm motor cortices are represented over the lateral frontal cortex, while trunk and legs are represented mesially. Within the dominant hemisphere, anterior inferior parietal tumors produce receptive language difficulties. Patients have difficulty with left-right orientation and comprehension of the spoken or written word. Difficulties may also be present with naming, calculating, and reading. It is uncommon for patients with parietal tumors to complain of focal sensory deficits, but they will say that an entire side of the body is numb. Specific to the nondominant parietal lobe are functions related to three-dimensional constructional abilities as well as common daily activities such as dressing. Disturbances in these areas may be indicative of tumor location. There may also be contralateral inattention to both the visual and tactile stimulation. In the dominant hemisphere, posterior temporal lobe tumors may produce difficulties with naming, calculation, and reading. Anterior and mid temporal lobe tumors may produce a contralateral quadrant visual sphere defect. Seizures not uncommonly are the presenting manifestation of temporal lobe tumors. 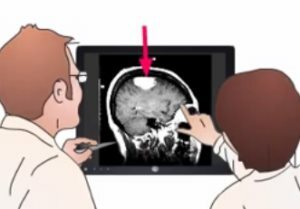 Occipital lobe tumors usually present with a visual field defect manifested by bumping into objects on the contralateral side of extrapersonal space. They may have irritative visual phenomena with nonformed visual hallucinations as simple as scintillating scotomas. Generalized seizure is not a common presentation of occipital lobe tumors. Tumors in and about the optic nerve chiasm, tract, hypothalamus, and cavernous sinus may produce either visual or endocrine disturbances. Lesions of the optic nerve produce unilateral visual loss while those of the chiasm produce a bitemporal field defect. Disturbance of hypothalamic function results in autonomic disturbances and endocrinopathy. Extension of any process into the third ventricle may produce noncommunicating hydrocephalus. Trigeminal neuralgia may be a feature of cerebellopontine angle or skull base extra-axial tumors. Tumors of the pineal region produce symptoms related to elevated intracranial pressure from hydrocephalus and disturbance of coordinated eye movements. Tumors of the brain stem typically cause multiple cranial nerve palsies—usually cranial nerves V, VI, and VII—followed by ataxia and long tract sensory and motor signs. Tumors of the midline cerebellum may produce a midline truncal ataxia or ipsilateral limb ataxia or incoordination when involved in the cerebral hemispheres. In many cases there is associated noncommunicating hydrocephalus. Vestibular and trigeminal schwannomas as well as petroclival meningiomas are the most common tumors in this location. These tumors produce a combination of specific cranial nerve dysfunction plus cerebellar disturbances and, later, hydrocephalus related to kinking of the cerebral aqueduct. Most patients with primary brain tumors do not have specific laboratory findings on routine blood work. However, for germ cell tumors, human chorionic gonadotropin, carcinoembryonic antigen, and placental alkaline phosphatase may be elevated. Patients with malignant primitive neuroectodermal tumors require examination of cerebrospinal fluid for central nervous system axis staging that may direct further treatment. For patients with metastatic tumors, evaluation of the primary organ system with appropriate imaging studies is necessary in order to adequately stage the primary tumor locally. Most patients with intracranial brain neoplasms are imaged using MRI as the standard. The addition of intravenous paramagnetic contrast agents preoperatively helps predetermine the possible grade and the site for the most definitive biopsy. Anatomic detail derived from MRI is superior to that of CT scanning. Functional localization of eloquent areas of brain and their relationship to the associated tumor is also possible with functional MRI techniques using blood oxygen level-dependent contrast imaging. In addition, magnetic resonance spectroscopy can also help define the metabolism of volumes of tumor that are independent from static imaging features. MR imaging of the spinal axis is another important feature for staging those malignant tumors with a propensity for leptomeningeal spread, such as medulloblastoma and germinoma. Following tumor tissue biopsy or removal, standard histologic and immunohistochemical techniques are used for distinguishing different tumor cell types. The proliferative potential for tumors can be derived by MIB-1 (evaluating Ki-67 expression) or proliferating cell nuclear antigen (PCNE) labeling studies. Molecular markers such as P53 status and loss of heterozygosity of genes on portions of chromosomes (-1p, -19q for oligodendrogliomas) may have important therapeutic implications. Because brain tumors can cause focal neurologic signs, many conditions may be simulated by brain tumor. In infants and adolescents, unexplained seizures usually herald the onset of idiopathic epilepsy. In adults, the onset of seizures is usually the first manifestation. Vascular malformations, degenerative diseases, subdural hematoma, brain abscess, encephalitis, meningitis, and toxic states may mimic a tumor. Parasitic infections may mimic a benign brain tumor. Opportunistic infections in immunocompromised patients may present as mass lesions. Multiple small ring-enhancing lesions, seen with some forms of pyogenic brain abscess, may mimic intracranial metastases from a systemic primary. Even with the advent of modern imaging techniques that now are able to evaluate the metabolic “fingerprint” of a tumor, the final diagnosis still rests with tissue examination of the imaged lesion.